Many smartphone makers are racing to launch their new flagship phones at the Mobile World Congress that is going to be held very soon. HMD Global has also jumped into the race and is prepping to release one of their highly anticipated phones, Nokia 9 PureView at the event. Recently, the Upcoming Nokia 9 PureView got certified at China’s 3C. The certification doesn’ t reveal much about the handset. However, it only revealed that it will come with 18W Fast Charger. Furthermore, according to the ratings, the adapter can support both Qualcomm’s Quick Charge and possibly USB-Power Deliver up to 15W via the 5V @ 3A current. According to the previous reports, the smartphone will have seven holes. Five will be for the Penta camera setup, one for the flash, and the last one will be for the optic sensor. In addition to that, there will also be a mic-hole just above the Penta-camera setup of this highly anticipated handset. A month back, three versions of the phone with the model numbers TA-1082, TA-1087, and TA-1094 got certified by the Bluetooth SIG as well. Some of the Rumors also claimed that the smartphone will have a notch-less 5.99-inch 2K (read QHD) PureDisplay with HDR10 support. Moreover, the smartphone will have an in-display fingerprint scanner. 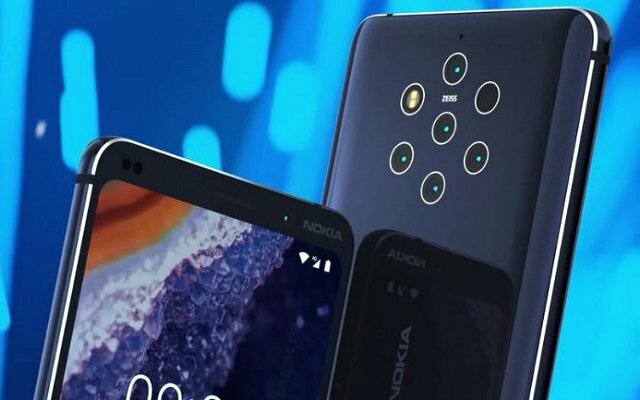 One more promising feature of Nokia 9 PureView is that it will come with Qualcomm’s Snapdragon 845 chipset. Moreover, the phone will come with 6GB of RAM and 128GB of built-in storage. Moreover, the phone will allow you to capture portrait mode shots with adjustable bokeh. It can also change the focus point after the shot is taken. The Nokia 9 PureView will also feature some sort of night mode. The handset will see the light in Barcelona on Feb 24.